Since the introduction of the carbon tax in 2008, BC has achieved reductions in fuel use of 17.4% per capita and even greater reductions (18.8%) relative to the rest of Canada. During this period there has been a large increase in the number of Canadian vehicles crossing the BC border into the United States , especially for day trips. It is likely that the main purpose of many of these trips was shopping. The current rate of Canadians visiting the US is not unprecedented. Larger numbers of Canadians crossed the border in the 1990s. Although high gasoline prices are a factor in motivating the border crossings, there were many other incentives, for example, the strong Canadian dollar, as well as cheaper dairy products, clothing and electronic goods. On average, a Canadian vehicle crossed the border an additional 1.3 times per year in 2012 compared to the rate before the introduction of the carbon tax. It is estimated that 1-2% of the refined petroleum product fuel consumed in BC was purchased in the United States as a consequence of the additional cross-border travel. This amount of fuel does not therefore show up in Canadian fuel sales figures, which requires us to make small adjustments to the provincial fuel-use estimates. 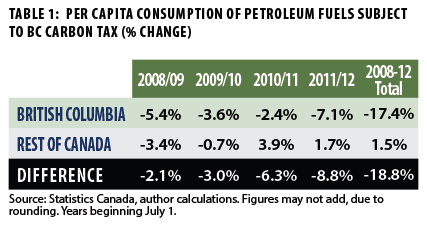 Nevertheless, the adjusted reduction in BC fuel use over the past four years still exceeds 15% per person per year. The BC carbon tax is an effective policy that has likely substantially reduced emissions, but has not harmed the economy. It is increasingly politically popular within the province.